A shock of black hair, little cleft chin, round face, little feet like a fish. Pelican. Pelican. Pelican. Two weeks later he is more than one-third larger. One day he’ll be over six feet. With a ten foot wing span and a layer of webbed fibers. Throat pouches full of water fish oceanic ripple spill sentient brim over full over The terns are fragile little birds, one dive into the oily water and they don’t resurface. I take the baby into the kitchen, and then in the red glow of the night light, we sway that baby sway. Pelicaniformas, ancient symbol of spill out spill over Later I come down the stairs for a glass of water. In the dark, the tv is on with no sound and Greg is stretched out in the chair, his big line-backer body and the infant curled up in his armpit, both sound asleep. Half a mile south, the Atlantic tide laps against the shore. Unable to fly, float, escape or find food—irritation, vomiting, diarrhea, oil aspiration, ulceration, skin death, confusion, vertigo tremors, seizures, cardiac arrest, hemolytic anemia, liver and kidney damage, sudden death, chemical pneumonitis, choking, coughing, gagging, swelling, bronchospasms, bleeding, fever. For long haired animals and birds it is worse. The chemical dispersants break the oil into tiny droplets, causing irritation, inflammation, headaches, genetic damage and mutations, difficulty breathing, vomiting, kidney and liver damage. Baby turtles leave their sandy nests and head straight for the sea knowing everything a turtle needs to know wavering back and forth spread out spill over brim over The largest fish on earth are four miles from the leaking wellhead. From Belize to Hondouras to Alabama. They filter plankton and tiny fish from the water through sieve-like mechanisms in their mouths. Each animal particular. Like a fingerprint. When the whale shark dies it disappears, sinking to the bottom of the sea plastic lifting too much too little wavering back and forth When one animal is extinct another proliferates. Biodiversity. The bristel worm is churning up the bacteria on the sea floor. The fishermen will die or relocate. And beach houses in Texas keep tar sandals as regular guest items, the oil just a nuisance, after all BP has been good to them, pouring money into their economy, and so they vote, yes, yes, yes. The light is white today and the oranges are glistening with rain water. Orange trees were brought here by the Spaniards, along with the Jesuit missions. Today the birds are quieter than usual. Maybe when they sing a lot, it’s because they are thirsty. The Santa Cruz used to flow year round, but then ranchers gold miners farmers population suburban water drain sprawl On Third Street, a young man comes out of a seven bedroom house to smoke on the porch. I pass under a big sparse tree with low branches, so old and just standing there, one of the tallest trees in the neighborhood. It appears deciduous, but in fact it’s a low pine, an Allepo, an ancient tree from the Mediterranean. The estimated appraisal value is well over $20,000. Anne tells me on the phone that they were brought to Tucson as seedlings by a gas station as a gimmick 70 years ago too much too little Water flows from the Colorado River to the Gulf of Mexico and Tucson garden hoses overflow downpour perennial springs irrigation tree-lined rivulet monsoon riverbed barren run dry Stein says “the work of man is not in harmony with the landscape, it opposes it and it is just that that is the basis of cubism.” Peddling along, I look down at my blue socks, one higher than the other. No city money for street repair this year, but instead an incredible pattern of intersecting cracks and potholes. Barbara Henning is the author of three novels, seven books of poetry and a series of photo-poem pamphlets. Her most recent books are a collection of poetry and prose, Cities & Memory (Chax Press 2010), a novel, Thirty Miles from Rosebud (BlazeVox 2009), and a collection of object-sonnets, My Autobiography (United Artists 2007). 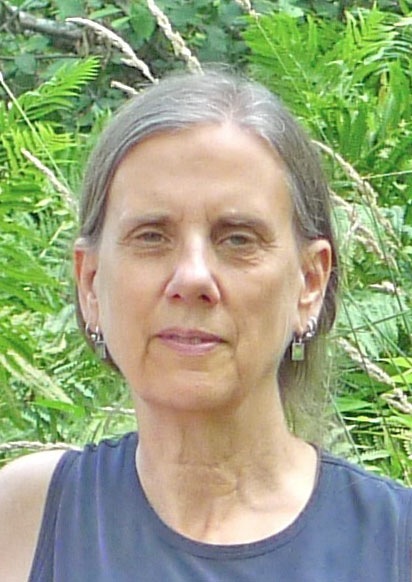 She teaches for Long Island University and Naropa University.